Itineraries and Rates: from $20 per person. If you really want to experience Bocas del Toro's boat tours at their best you should consider a Catamaran Sailing Tour or a Snorkel Boarding Tour. Why? Besides the fact that you'll receive superior customer service with great guides and boat captains, you'll also be participating in more eco-friendly tourism practices as their boats utilize more efficient motors and they'll without any doubt be respectful towards the wildlife and environment. * Prices are in US Dollars. 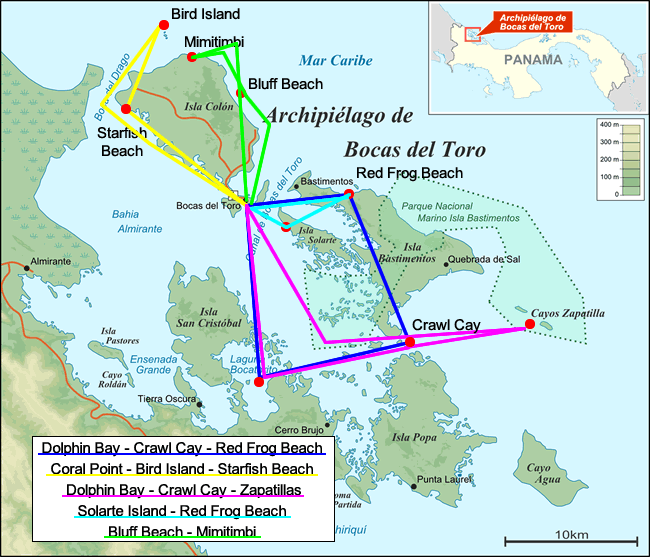 The above prices are per person and do not include Panama's 7% ITBMS Sales Tax, nor $3 entree fee to Red Frog, nor the $10 National Park Entrance fee (Zapatillas Island only). Rates include boat tour, guide and snorkeling masks. A minimum of 3 guests is required to book any of these tours. Tour itinerary can change depending on sea conditions. 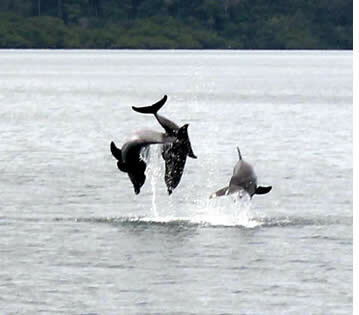 The Archipelago of Bocas del Toro is home to a semi-permanent population of Bottlenose dolphins. Its calm waters and abundance of small fish, crustaceans and squid seem to make the perfect grounds for the young ones' first stages of life. Calves and juveniles can be frequently spotted with their mothers, as well as small pods of 5 or 6 dolphins. 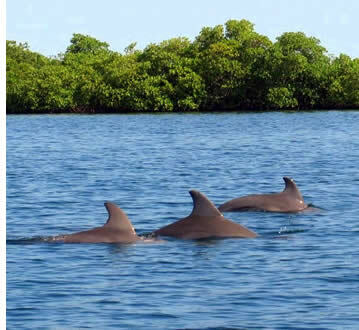 The dolphins of Bocas del Toro seem to have a special predilection for the bay locally known as Laguna Bocatorito (Dolphin Bay), which is about 12 km south of Bocas Town (about 15 - 20 minutes by boat). This bay is bordered by the east side of Cristobal Island and an odd-shaped peninsula from the mainland. A labyrinth of shallow channels formed by mangroves screens its northern entrance, helping to make it a kind of giant natural aquarium, six kilometers across at its widest. 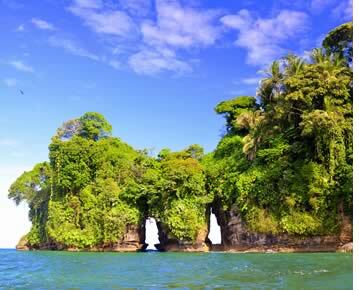 Most boat tours in Bocas del Toro include a visit to Dolphin Bay as it is almost guaranteed to spot some dolphins graciously playing around. The best chance of seeing them is during those months when the swell is up (January to March, June and July) as they are driven to these calmer waters. As with any boat tour, the boat captain plays a very important role when visiting Dolphin Bay. Good boat captains will respect the dolphins space and allow them to approach the boat at their own will without swarming around the dolphins which could possibly lead to hurting them. Due to its popularity, Dolphin Bay can also become crowded as most tours leave Isla Colon around 9:30 a.m. so make sure to visit Dolphin Bay earlier or later during the day. Book a tour with us and we'll make sure that you enjoy the experience in an eco-friendly way. 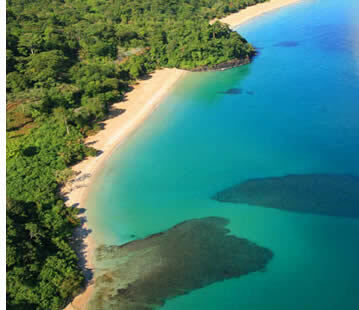 One of the most famous snorkeling spots in Bocas del Toro, Crawl Cay is a tiny island located in the channel between Bastimentos and Popa Island (about 20 minutes by boat from Bocas Town, or 10 - 15 minutes from Dolphin Bay). Crawl Cay is surrounded by lush coral gardens, the best of which begin just after the south-eastern tip of Bastimentos Island (make sure your boat driver takes you there, and not just to where the restaurants are). The sea here is calm year-round, which make it suitable for snorkelers of all ages, and the abundance of tropical fish, coral heads and colorful sponges will keep experienced divers entertained as well. Water clarity is better than at other places but as always it depends on if it's rained during the previous days. On the typical Caribbean day with lots of sunshine and light blue skies, the waters of Crawl Cay are of luminous emerald green shades and make the perfect holiday postcard. There are three restaurants on this cay built on stilts over the water, so most visitors will order some fresh sea food before heading out to snorkel and in this way a delicious meal will be awaiting for them once they're back. The food is simple but fresh and flavorful (and a bit more expensive than on Bocas Town). Located on the south-eastern border of the Bastimentos National Marine Park, the Zapatillas Cays are two stunning islands that emerge from a coral platform and are surrounded by tropical coral reef. About a 30 minute boat ride from Crawl Cay (roughly 8 kms), the Zapatillas Islands are generally considered the most beautiful islands of the Bocas del Toro Archipelago and offer visitors pristine white sand beaches, crystal clear turquoise waters and some of Panama's most attractive coral reefs. Some say they receive their name from a fruit that grow in its forests, and yet others because their shape resemble a pair of running shoes (" zapatillas" in Spanish). Western Zapatilla or "Zapatilla Menor", is less than half the size of its eastern counterpart, and is nesting ground for the Green Marine Turtle. Leatherback and Hawksbill Turtles lay their eggs on both islands. This island is more visited by scientists than by tourists. Eastern Zapatilla or "Zapatilla Mayor" is home to the ranger station (the rest of the cays are uninhabited), where a $10 Park Fee is collected from visitors ($3 for Panamanians). The best snorkeling and diving in Major Zapatillas can be found towards the south-eastern coast, about 300 meters from the beach in a spot known as Coral Islands. This spot is relatively shallow and has the most beautiful coral formations with lots of tropical fish, and its crevices hide many lobsters, crabs, eels and an immense amount of tiny sea invertebrates. If you want more than a just a gorgeous reef, on the Zapatillas' north shore, you can go behind the breakers (the reefs that break the incoming waves... when there are waves). If the sea permits (mainly May, September, October), you'll find a wall formed by the reef, that contains small caves and tunnels, up to 40 feet deep. All of the beaches on the islands are excellent for swimming, and there is a rough 45-minute nature trail that makes its way through mangrove swamp. With some difficulty, you can complete the circuit through the center of the island and return along the beach. 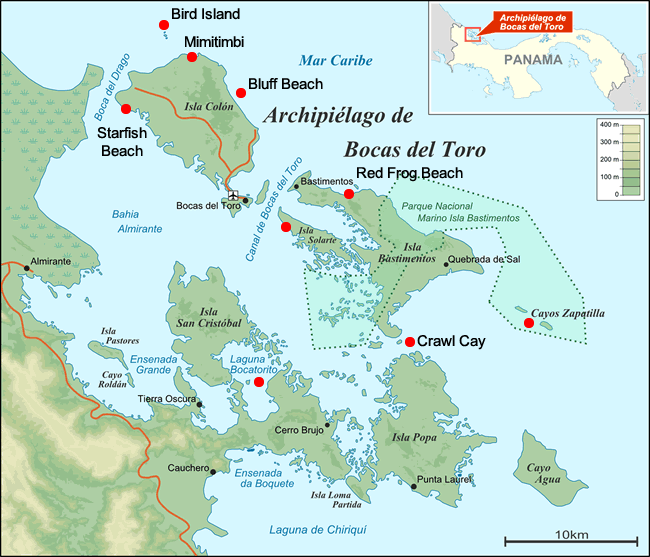 About a 10 minute boat ride from Bocas Town gets you to the Red Frog Marina, from where a 15 minute hike across the narrowest point of Bastimentos Island allows you to reach Red Frog Beach. 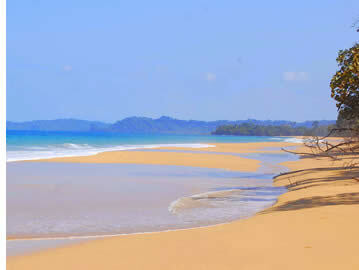 With 0.75 miles of white and golden sand, Red Frog Beach is one of the most popular beaches in Bocas del Toro. The north shore of Bastimentos Island hosts some of Bocas' most beautiful beaches and Red Frog is one of the more accessible ones, and the only one with a few facilities such as a couple of restaurants and bathrooms. It receives its name from the poison-dart frogs that are abundant in Bastimentos' hills. If you're lucky enough you might encounter a three-toed sloth or some monkeys as well. Due to its ease of access many boat tours make Red Frog Beach their last stop during the day, providing you with a lively environment with travelers from all over the world (anything between 100 and 300 people). During low season, it is a lot quieter. If you happen to arrive to Red Frog and feel the need for more space to yourself you can always hike a bit to the east (Turtle Beach) or to the west in direction to Wizard Beach (Playa Primera), or simply go to another beach in Bocas del Toro with less people... there are loads of secluded beaches in Bocas. Famous for its abundance of starfish (you'll literally encounter hundreds of them in this beach), Starfish Beach is a must visit destination of the Bocas del Toro Archipelago. 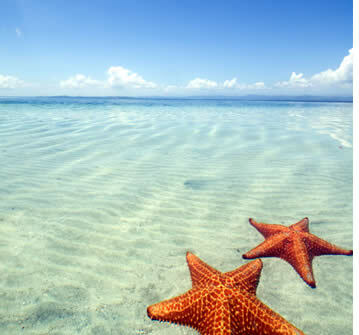 Starfish beach is located on Colon Island, on its north-western side (opposite side of Bocas Town). Even though it can be reached by bus from Bocas Town (30 minutes), most tours that visit Bird Island (about 30 minutes from Bocas Town by boat) make a stop at this beach, either before or after lunch. It's about a 20 minute boat ride back to town from Starfish Beach. Due to its location, its waters are very calm during most of the year, except during certain times in November and December when the swell comes up from the north. Its crystal clear waters and abundance of starfish make it a big favourite amongst visitors of all ages. Definitively one of the most beautiful beaches in Bocas del Toro. Swans' Cay, also known as Bird Island is birders paradise. Here you'll find the only known nesting place in the Caribbean of the Red-billed Tropic Bird (Phaeton aethereus). Swan's Cay is a rocky formation approximately 70 meters long, with a rounded quarter moon shape, pierced by two openings through one end, and rises 55 meters at the highest point. On the southern side, sheltered from the northeastern trade winds, there is a small sandy beach below a higher level area. Bushes and other vegetation cover the summit, and there is a small clump of coconut palms at the low end. A designated bird sanctuary, Isla Pajaros, also has brown booby (Sula leucogaster etesiaca), the brown pelican (Pelecanus occidentalis carolinensis), the frigate (Fregata magnificens) and many types of gulls and terns. A 5 minute boat trip from Isla Colon, Isla Solarte or Nancy's Cay, is a 8 sq. km (3 sq. 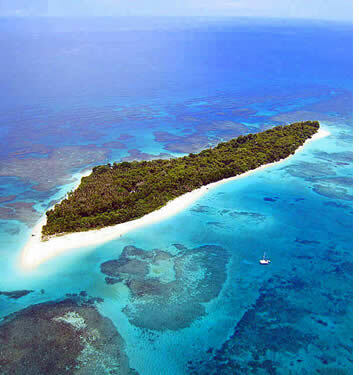 mile) island known for Hospital Point, on its western tip, which lies just across the deep channel to the east of Isla Carenero. Isla Bastimentos protects Isla Solarte from the open Caribbean. Hospital Point is one of the most accessible sites for snorkeling. Hospital Point is named for an old hospital built by the United Fruit Company to treat plantation workers suffering from yellow fever and malaria. There are a few homes behind Hospital Point, and also a small indigenous community but most of the island is covered with rainforest. With 5 kms of pristine powdery golden sand and very little development, Bluff Beach is a favourite amongst those looking to experience their own private stretch of beach. 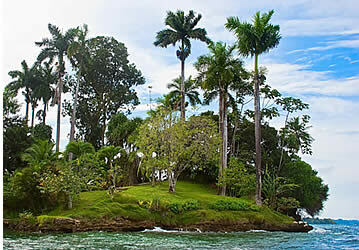 Bluff beach is Bocas at its best: a wild and exuberant jungle meets the stunning Caribbean Sea. When the swell is up, it really isn't suitable for bathing as it is directly exposed to the surf, but at low tide you can sometimes find tranquil tidal pools suitable for the younger ones. During certain months when the sea is flatter (May, September, October) you couldn't ask for a more beautiful natural swimming pool. This beach starts in the mid-eastern section of Colon Island and can be reached from town via a 20 minute drive or if the sea is calm can also be reached by motorboat (about 15 minutes from town). A relatively small indigenous community with about 10 houses that is established very near to the Mimitimbi River on the north shore of Colon Island. Some say that Mimitimbi hosts the most beautiful beaches. It's about a 25 minute boat ride from Bocas Town, or a 10 minute boat ride from Starfish Beach. The key to having a wonderful boat tour in Bocas del Toro is your boat captain. If you go to the docks and randomly select your boat captain it's really hit or miss. We work with several boat captains that are knowledgeable and reliable. It also really helps to start your boat tour as early as you can (9 a.m. by the latest) as certain places such as Dolphin Bay and Crawl Cay can get a bit crowded later on during the day (not good for the wildlife at all). Island by island, beach by beach... Contact us!